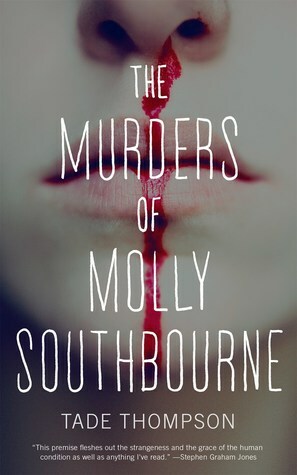 I don’t usually care for horror, and Tade Thompson’s The Murders of Molly Southbourne seemed like a fairly straightforward horror concept when I read the cover copy. 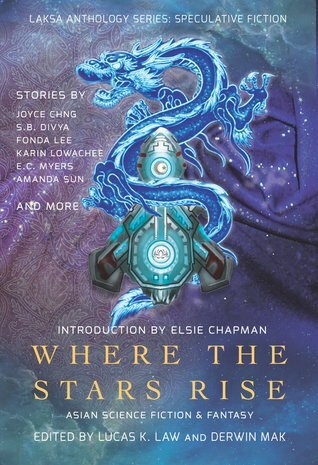 However, I read pretty much all of Tor.com’s novellas, and I appreciate that doing so tends to get me to read outside my comfort zone and try new things. Still, I didn’t expect that I was going to start this book sometime after my midnight bedtime and find myself unable to put it down until I finished it an hour and a half or so later. It’s a compulsively readable, at times deeply disturbing fable with a compelling heroine at war, literally, with herself. Molly Southbourne is brilliant, brave, and cruel in turns, an often unlikable woman who is nevertheless deeply sympathetic as she tries to find some way to live a normal life while dealing with a condition where anytime she bleeds, it grows a new molly who quickly becomes intent on killing her. Even Molly’s earliest memory is of murder, and she’s lived her entire life by a set of strict rules intended to keep her safe from her other selves, but it’s exhausting, physically and mentally. 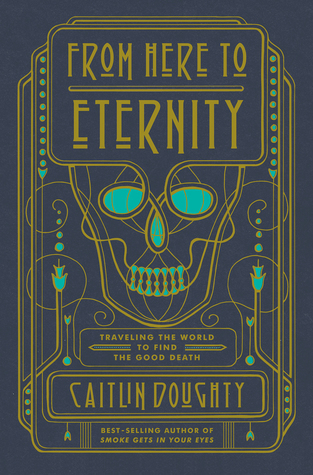 The mix of body horror and psychological is well-conceived and cleverly executed, and every word and image in the book feels methodically intentional. It’s a parable with several possible interpretations, all of them interesting, and Thompson makes smart use of classic fantasy and science fictional elements to touch on ideas about identity, cloning, family, and the effects living a life full of violence has on a person. 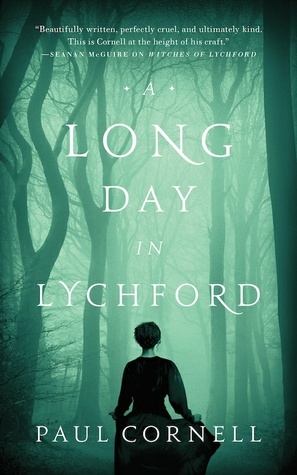 I’ve loved Paul Cornell’s Lychford novellas since the beginning, but A Long Day in Lychford is very different from its predecessors and I’m still not sure if I think it’s a step forward or back for the series. Whereas the two previous books had something of a timeless feel to them—though they also dealt with the modern-day issues changing the landscapes of small towns—this one digs into the UK’s Brexit debate with mixed success. It’s a timely story, but it’s also a painful story to read. After focusing more on Judith and Lizzie in the first couple of Lychford books, this one shows us a bit more about Autumn, who we learn is pretty much the only person of color in Lychford. After the Brexit vote, things get uncomfortable for her, and it causes a rift between Autumn and Judith that leads, albeit somewhat indirectly, to a magical mishap that needs to be fixed. It’s a definite change of pace from the first books in the series, and it feels more deeply personal and immediately relevant than the previous two novellas that dealt a little more broadly and abstractly with small town issues, but it’s also perhaps a little overambitious for its short page count. Things wrap up a little too neatly in the end, and Cornell’s main thesis is somewhat garbled by using a sort of metaphor about the border between Fairy and Lychford and tossing in some upsetting news about Judith that has some unfortunate implications re: her vote on Brexit. It’s possible to have too much nuance for a short novella. Emma Newman’s gaslamp fantasy series continues with a new mystery for secret mage-in-training Charlotte to puzzle through. Her brother Ben has settled into his role as an apprentice Mage, and he seems to be thriving at his new position at a mill in Manchester. The problem is that the mill seems to be haunted—either by ghosts or by rebellious workers—and Ben calls in Charlotte to go undercover and investigate. 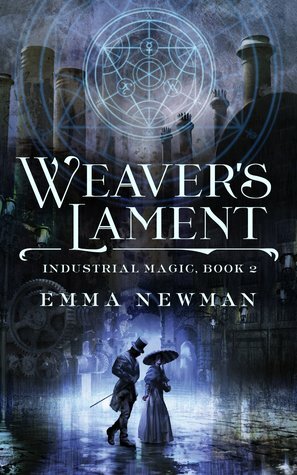 It’s a decent premise, and it’s never a bad time for a new book about workers’ rights, but everything about Weaver’s Lament feels a little rushed and its treatment of serious issues is perfunctory. Charlotte is a likable heroine, and she’s sensitive to the injustice and abuse she uncovers in Manchester, but secondary characters are given short shrift while Charlotte easily returns to her status quo at the end of the book. Also, while I’m a fan of slow-burning will-they-or-won’t-they romances, it’s difficult to be invested in Charlotte and Magus Hopkins when they spend so little time together in stories that are so small in scope. Brother’s Ruin and Weaver’s Lament have both dealt heavily with uncovering largescale injustices that deeply affect the characters’ lives, and these things also form the primary barrier to the central romantic relationship of the series. However, there’s been very little forward movement on any front. The romance is limited to lingering glances and subtle chemistry, and the systemic injustice and probable evil of the Royal Society of the Esoteric Arts isn’t confronted head-on and doesn’t seem likely to be any time soon. Though it’s not without problems, Weaver’s Lament is still an entertaining read. It just feels like it could have used about a hundred pages more of breathing room, mostly so that it could do a bit better justice to the new friends Charlotte makes at Manchester. It’s not always a good thing when a story leaves you hungry for more. 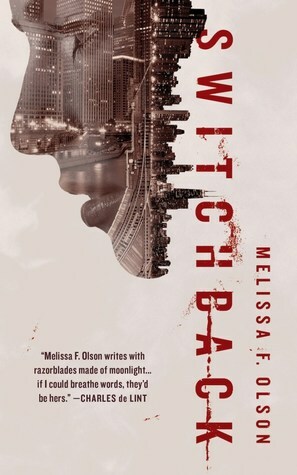 Switchback is a decided improvement over its merely workmanlike predecessor, Nightshades, which introduced Melissa F. Olson’s near future noir world in which humans are reacting—sometimes poorly—to learning that vampires exist. Whereas Nightshades was full of clunky exposition and worldbuilding, everything about Switchback is more relaxed and self-assured. It’s a better-plotted mystery with a more satisfying overall arc, and Olson makes the wise choice to focus more on Lindy, the vampire consultant who is more interesting that the rest of the main cast put together. While there are still some mysteries surrounding Lindy’s past, by the end of Switchback she feels like a fully realized character. “What if the world suddenly knew vampires are real?” is a question that has been answered many times in fiction, and I’m not sure there’s much new ground to cover on the issue, but Switchback retreads well-worn paths confidently while shifting focus to a fresher perspective than Nightshades had. I wasn’t sure about continuing with this series after my lukewarm feeling towards that book, but after this one I’m rather looking forward to seeing what Olson does with it next.